On the look out for a nice new notebook computer? Take a look at these reviews from around the net. 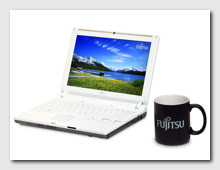 Fujistu have just introduced a new ultra-portable notebook, the LifeBook P7230. It comes in two versions, the difference being one is in a black leather finish and the other is in a white leather finish. The screen is a small 10.4 inch LCD and the machine is very light at just 2.63 lbs. If you're after a tough notebook, take a look at this article. If a big not-so-portable beast is your thing, then take a look at this monster, the Rock Xtreme SL Pro with a 20 inch display. It has two Go 7950 GTX SLI graphics adaptors working in tandem.